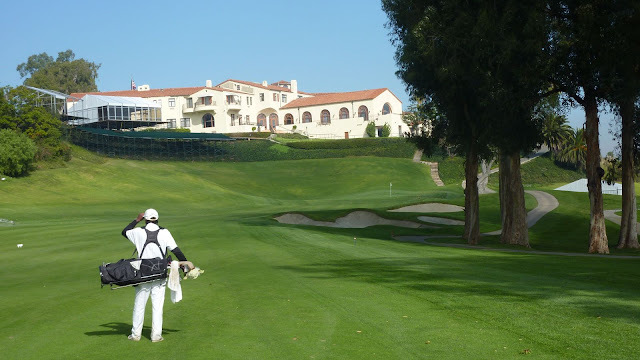 Day Two of my Southern California golf adventure was spent at the vaunted Riviera Country Club, site of this week's Northern Trust/Nissan/Glen Campbell Los Angeles Open. 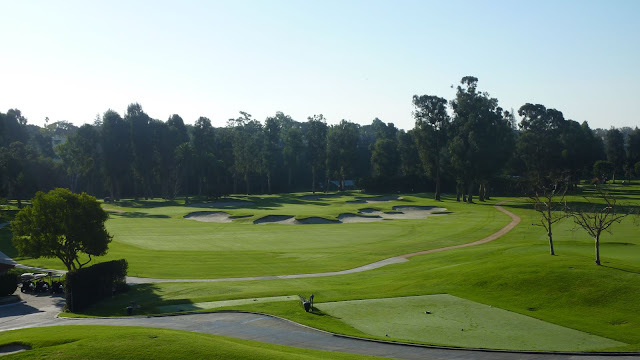 Riviera is steeped with golf history, with an event dating back to the 1920's and an impressive list of winners. 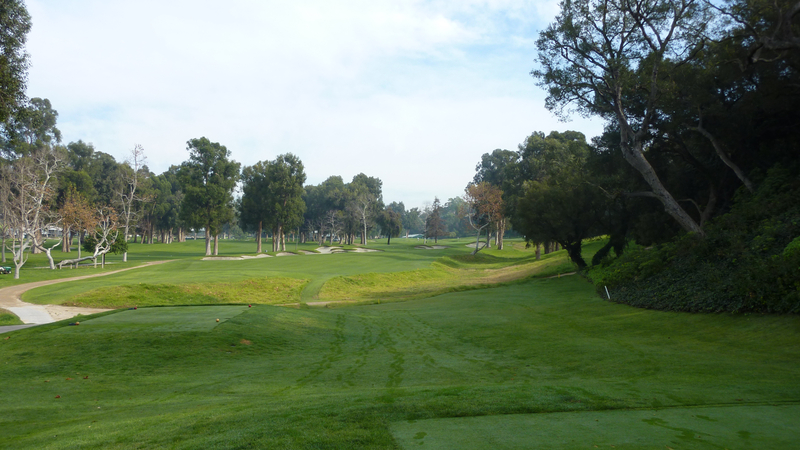 The course is commonly known as Hogan's Alley, honoring Ben Hogan's three LA Open and 1948 U.S. Open victory there. As you can see from the picture above, you are only a few feet from the clubhouse and right next to the club's restaurant, where diners can watch you cold top one into the barranca. 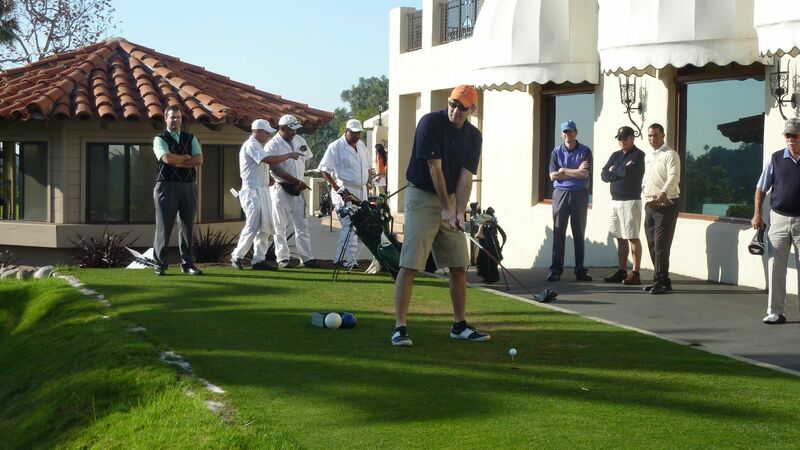 To top it off, the starter even announces your name on the tee like you're playing in the U.S. Open. 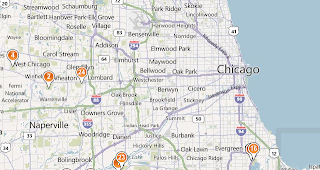 "Next on the tee...from Wheaton, Illinois...(a 6'2 soph-o-more)...Jim Colton" I put a hurried swing on the ball and pushed a low-screamer down the left side, a skunky shot but safely in play (by a good 10 feet at least). 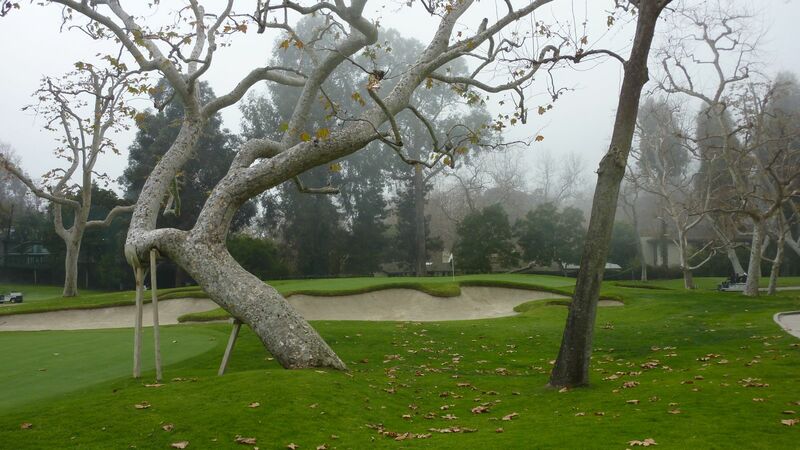 The picture below of the 1st green provides a preview of what you're going to be dealing with a Riviera. 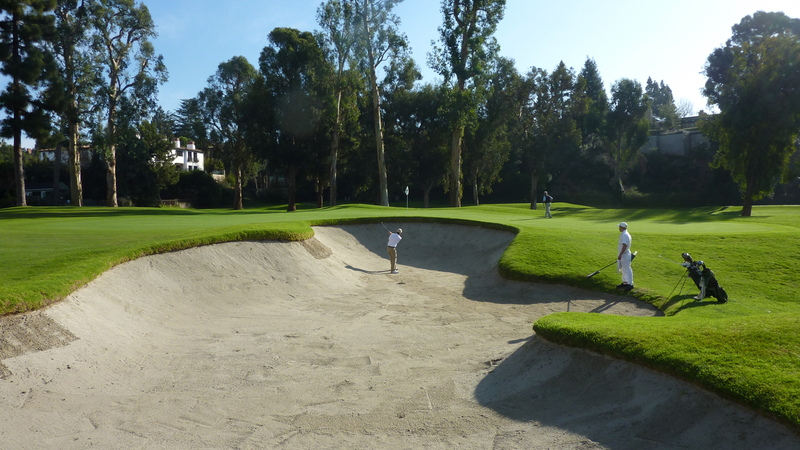 Slick, confounding greens that are well-protected by deep, deep bunkers. The stretch from the 4th to the 8th is probably the strongest on the course and one of the best stretches of golf on the planet. 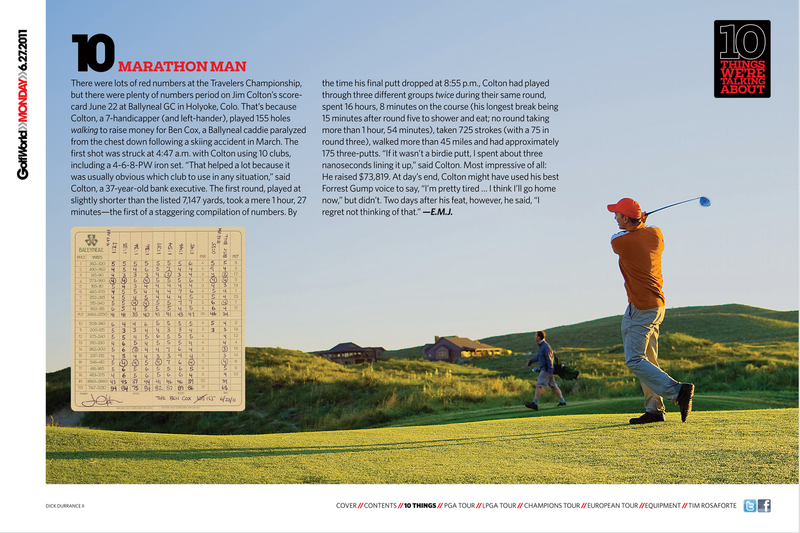 Hogan called the 4th the "best par-3 in America". For someone with Hogan's shotmaking skills, it was the perfect opportunity to gain a shot on the field. Try a long one-shotter with Redanish-qualities - for us mere mortals it means trying to hit a towering, right-to-left 3-wood on the perfect spot short and right of the green. In other words, I had absolutely no chance. The 5th, pictured below, features a split fairway to a downhill green. The manmade mound short and right of the green does not really come into play, but can mask some of the right pin-placements and generally gets into your head. George C. Thomas moved a ton of earth to build Riviera - I believe it was the most expensive course ever built at that time - specifically to inject strategic interest and character into his golf holes. The par 3 6th is one of the most infamous par 3's this side of the 17th at Sawgrass. "Who the heck put a bunker in the middle of the green?" I asked sarcastically as we reached the tee box. The bunker-in-the-middle-of-the-green trick has been copied a few times but very rarely with the same level of success as the original. First, the bunker effectively breaks the very large green on this relatively short par-3 into subsections. With a mid-to-short iron in your hand, you should be able to hit to the specific part of the green. Miss and you pay the price, but all hope is not lost. The slopes on and surround the green allow you to get to the pin even if the bunker is directly in your way. You can see that clearly in the shot below. Our host missed the green short and right, then deftly played a chip shot on the far right edge of the green and watched his ball trickle down the slope towards the hole. You can see my tee shot in the pic below, just right of the flag. Unfortunately, I missed the 10-foot birdie putt. The 7th is a solid, straightforward risk-reward par 4's. Big hitters can flirt with the bite off the wash on the right and leave a desirable angle on the second shot. Shorter or safe players can bail out left but leave a tougher approach and bring those deep fairway bunkers into play. Simple, yet effective. One thing that stuck out after my round there was the diversity of shots one is required to play at Riviera. It is a shotmaker's course, for sure. I think that may be its greatest strength. Kudos to GCT for bringing that out of a relatively flat site. The 10th hole at Riviera is considered by many to be the best short par 4 in the world. Sadly, I did not get to experience the 10th in all its glory, as the green was closed off in preparation for the upcoming tournament. We played to a temporary green that you might be able to make out near the right strand of trees in the distance. 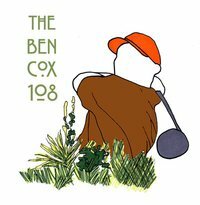 The reason the 10th continues to baffle golfers to this day is the green. Check out the sliver of short grass that they call a putting surface. Worse yet, you can see how it slopes away from the golfer who tries to come straight at it from the tee. The safe play is to aim way down the left side of the fairway, seemingly away from the hole. Only then can one open up and angle to the green. Sure, one can go after the green off the tee and try to get up and down. 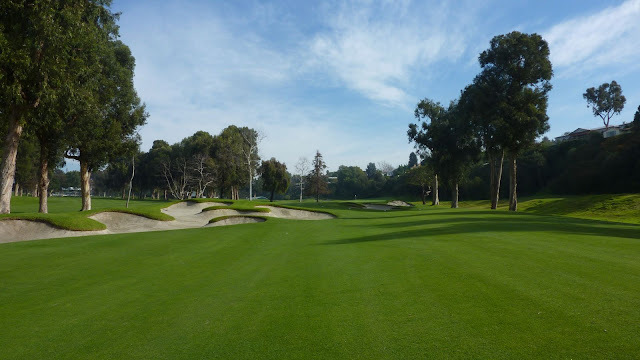 However, I'm sure Riviera has seen it's fair share of bull-headed golfers over the last 80 years trying to overpower the hole only to be left with an awkward half-wedge over a greenside bunker to that green. 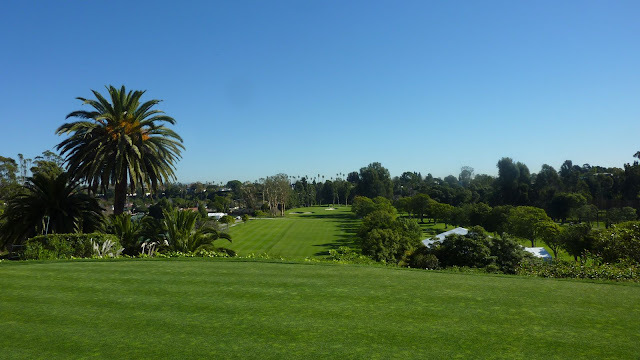 One thing I need to talk about at Riviera is the Kikuyu grass. I've never played anything like it. 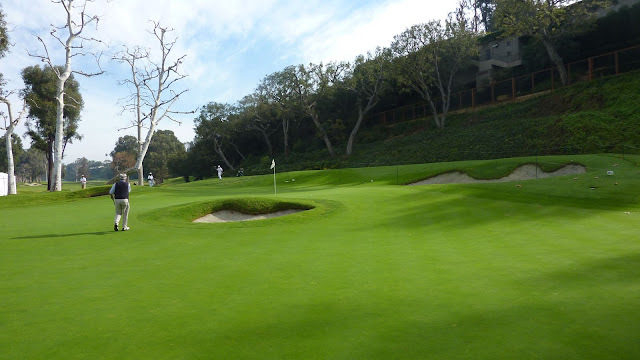 On approach shots and especially chip shots, you absolutely have to play an aerial shot that lands on the surface of the green. A well-struck shot that lands six inches short of the green will just bounce straight up in the air and stop dead in its tracks. 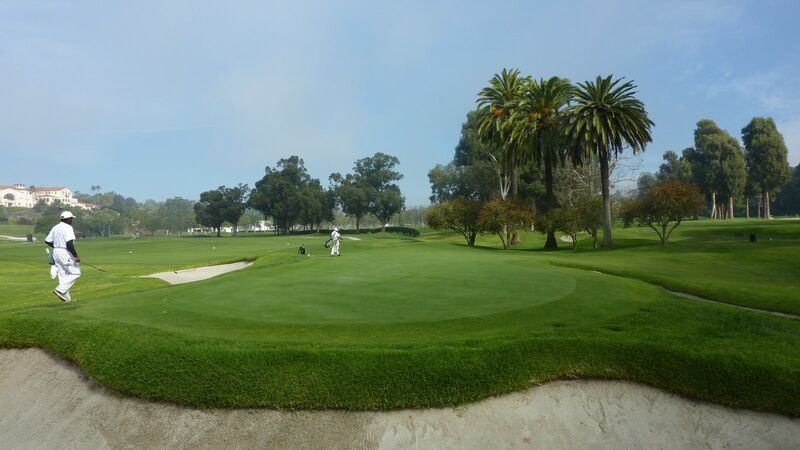 Throughout the round, you could hear golfers on adjacent holes simply say, "Kikuyu! ", which was code for hitting what looked like a good shot only to get denied by the turf. 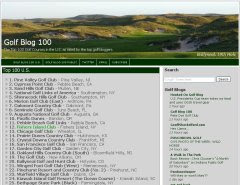 My playing partner, Matt, who as head pro at Ballyneal has become accustomed to hitting ground game shots from just about anywhere, challenged the Kikuyu with bump and run shots on many occasions and failed most of the time. As the round wore on, he kept clubbing up and swinging harder until finally a 40%-stength, running 3-wood was enough to finally conquer the kikuyu. Matt felt triumphant, even though the final tally was Kikuyu 10, Matt Payne 1. 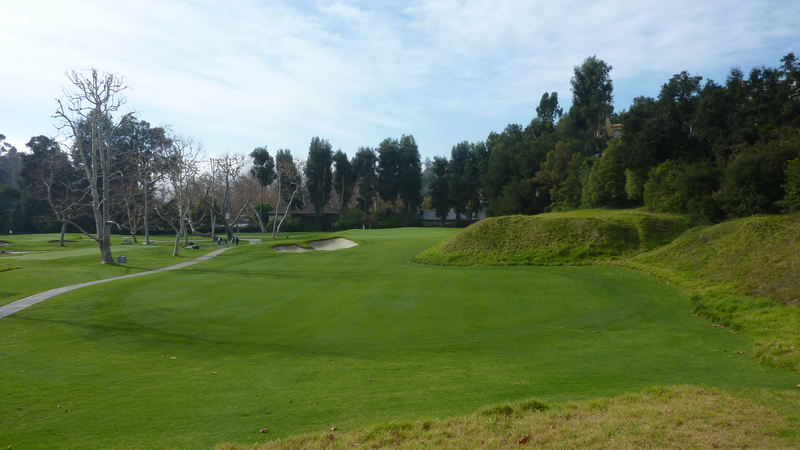 Below is a shot of the 16th, a short par-3 to a tiny, obviously well-protected green. 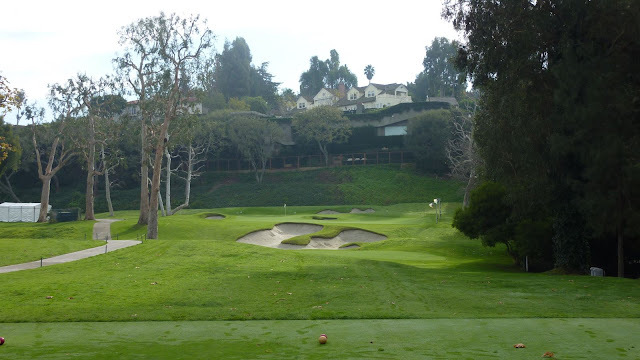 I know you've seen this hole on TV before - the iconic 18th at the Riv. What I didn't realize before playing the hole was just how uphill the tee shot is. I'm going to pretend that this picture was taken from the spot of my second shot, although anybody who has seen my sub-optimal, 2.5 degree launch angle can probably figure out that my drive was embedded deep into the hill only 120 yards off the tee. Oh well. Nothing could damper what was an extraordinary day at Riviera.